Bear with me. It’s been years since I’ve seen the original Adventures in Babysitting. To be honest, the only reason I was really excited for this reboot was the fact Sabrina Carpenter (Girl Meets World) is involved. I’ve never watched The Descendants, so I wasn’t sure what I’d be getting into when it comes to Sofia Carson. I vaguely remember the original but yes, the babysitter loses track of the children. It’s your classic old tale of “What should the babysitter do?” The movie follows the story of two unlikely personalities joining forces to ultimately come together in the end to find the best of each other that they never knew existed. Sabrina Carpenter plays Jenny Parker, the very put together, rigid student set for college. On the other hand, Sofia Carson plays the rebellious nineteen year old “babysitter” Lola Perez, who is only interested in pursuing the babysitter job for the money. They were first introduced to one another when applying for a creative internship they both want for different reasons. Through outrageous shenanigans and adventures, we follow the tale of one character growing a thicker, adventurous skin (Jenny) and one learning about what it means to be an adult (Lola). For me, even though I’m 23 and should have my life semi-figured out by now, I closely related to both characters, one side learning how to “adult” but yet still wanting to embrace every moment in life. 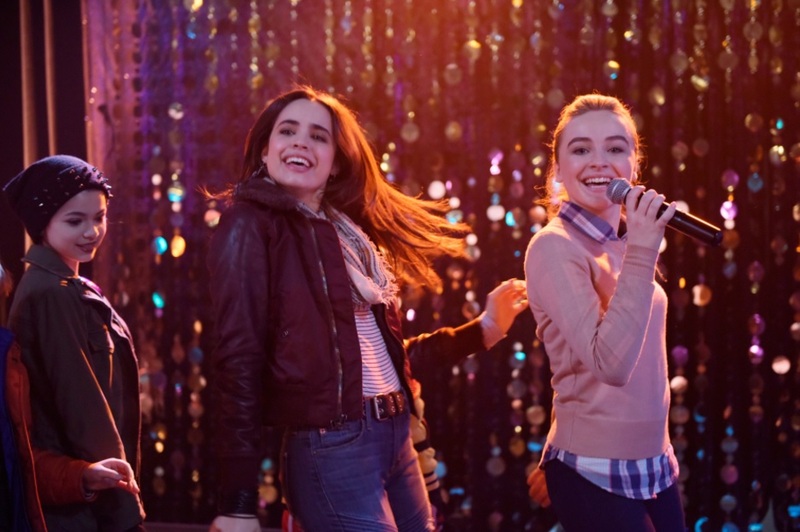 To my surprise, this Disney Channel Original Movie did not take on the same cookie cutter format of almost every single DCOM so far: cheesy, wholesome fun. What? You didn’t notice this when YOU were younger? Refer to High School Musical for crying out loud! That movie makes me cringe almost every minute after I re-watch it. Yes, it did have some cheesy moments, but what can you expect from a movie on a channel directed straight towards tweens and younger audiences? For example, tell me seriously… Who in the world is allowed to hop on the stage minutes after a huge band gets off stage? I’ve been to a fair number of concerts, and I’m kicked out minutes after the show ends. There were so many unrealistic moments but again, it’s a Disney Channel movie. What more can you expect?! The characters didn’t make me cringe as much as I thought they would. They were killer in their own way! Each had their moments but did it make me want to turn the other cheek? Nope. From the beauty obsessed girl, Katy Cooper (Mallory James Mahoney) to kid chef Bobby Anderson (Jet Jurgensmeyer), each character grew with the movie. It wasn’t a blockbuster SUCCESS, but it wasn’t a full on, “Oh, my God. What did Disney Channel do?” fiasco. I was content with Disney, and I approve of their reboot. Congrats to their 100th DCOM! Next ArticleTV Review: VICE on HBO - "Student Debt"